...sebab this coming Tuesday, we're watching 65daysofstatic live in KL! 65daysofstatic, an instrumental post/math rock band from Sheffield, England, are known for their massive live performances, having toured alongside bands such as Metallica, Lostprophets, Linkin Park and Deftones at major music and dance festivals. Their album, We Were Exploding Anyway, saw the band focus on bringing dance beats and soaring guitarwork to the table and kicking their chaotic live shows up a couple of notches. Their unique sound have caught the ears of the world and allowed them to transcend beyond the usual festival circuit to embark on new adventures, from warehouse raves in Russia playing to sold out Japanese festivals. 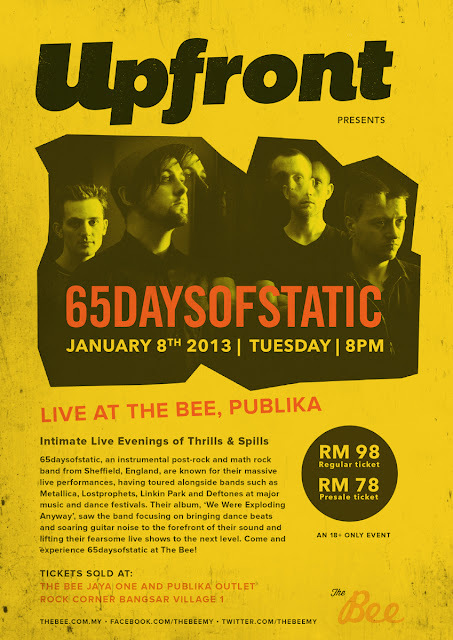 Come 2013, the group will be gracing Malaysian soil, thanks to Upfront at The Bee who will be bringing us more and more of our favorite independent acts, starting with 65 Days of Static! For more updated information on Upfront at The Bee, check out The Bee’s website here or their facebook page www.facebook.com/TheBeeMY.